Escondido Congressman Duncan Hunter, one of only seven congressmen to endorse Donald Trump. Escondido Congressman Duncan Hunter is one of only seven congressman to endorse Donald Trump. He hasn’t been bashful about that support either, even penning a Feb. 29 column for the San Diego Union Tribune touting his stance. Needless to say, Hunter’s support has found its critics, and that’s just among Republicans. His Democratic opponent has yet to weigh in on the controversy. The big question is how Hunter’s very vocal support will play in the district that extends from Escondido to East County and is nearly one-third Hispanic in make-up. Analysts, however, consider it one of the most conservative congressional districts in the nation. Hunter, 40, of Alpine, has served in Congress since 2009. Prior to that his father, Duncan L Hunter served in Congress from 1981 to 2009. It doesn’t get much more Washington insider than that making Hunter and Trump somewhat strange bedfellows at first glance. Hunter already has come under fire for his endorsement, although the fire is from GOP conservatives and Cruz supporters. His expected Democratic opponent, David Secor, has yet to weigh in on the controversy. Secor ran against Hunter in 2012, getting 83,455 votes, or about 32.3 percent of the electorate against Hunter’s 174,838 votes, or about 67.7 percent. Another Democrat, Patrick Malloy, has filed, but no information could be found on his campaign to date. Obviously, Hunter is named on the Carpenter’s trump those Trump supporters list. Gary Jacobsen, University of California, San Diego, political science professor considered expert in local politics, told Jim Cramer’s TheStreet recently that Hunter’s endorsement aligns with his own political persona. 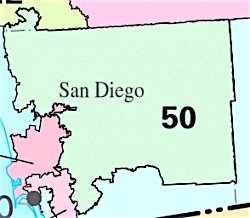 Escondido was put in a 50th Congressional District that mainly consists of conservative East County communities in 2010. Hunter has gone all in on the Trump train. He said he loved the “wall” because it would prevent crime. He approved whatever it is that goes for Trump’s foreign policy. Race 81.4% White, 5.2% Asian, 2.2% Black, 1.5% Native Am. 1 Comment on "Escondido Congressman Duncan Hunter climbs aboard the Trump Train"
Patrick Malloy, Democratic candidate for Congress in the 50th district, attacked his opponent–Rep. Duncan Hunter of Alpine–for endorsing Donald Trump for President. In a prepared statement, Malloy called upon the the congressman to stop embarrassing himself and the district with his anti-science views and his consorting with the vulgar rhetoric of Trump: “Duncan Hunter exposes himself to ridicule by his climate-denial attitudes and his hostility to women’s rights.” Malloy said that “this kind of naiveté would have been an embarrassment to even Hunter’s father, long-time retired congressman from the area.” Malloy stated that “Duncan Hunter, Jr. needs to represent his district and not hide behind coattails–he needs to be his own man,” Malloy concluded.